As Philippe knows only too well, this crucial step in the process is tricky. "We need a good swirl in the galvanic bath, the right temperature, some organic additives and a current at just the right strength and – if it's alternating current – in the right form." Eventually, the goal is to dissolve the springs out of the galvanic mold. Initially, the researchers use a light microscope to check whether the spring molds are filled correctly with metal. Then the top side of the mold is fine-polished to ensure all springs are of a defined thickness; the result is verified via X-ray fluorescence analysis. Finally, the paint is removed with an oxygen plasma, the silicon wafer etched away using a strong alkaline solution and the gold coating dissolved. The remaining springs then need to go into a special washing machine for a few hours to remove any ridges and protruding metal remnants. 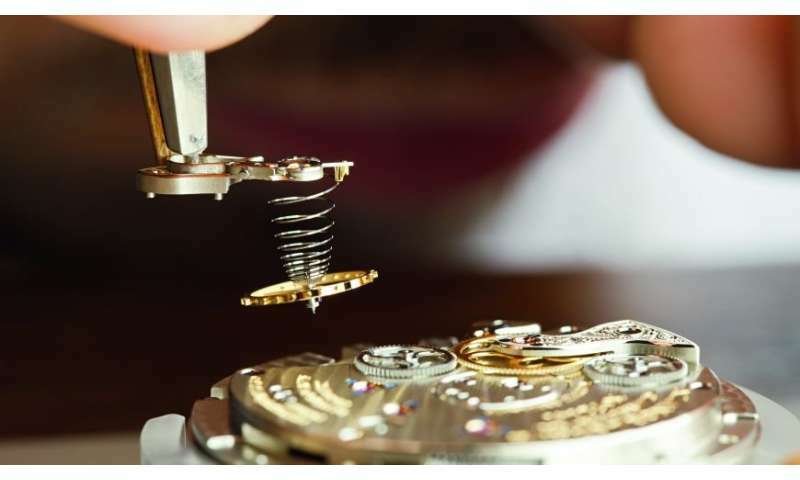 These flawless springs then go into the watch lab for prototype production. For the researchers at Empa, however, this kind of prototype production is only one aspect of their scientific work. "Our goal is certainly not to compete with suppliers in the watch industry," says Michler. "At Empa, we are mainly interested in the process of miniaturization itself." Michler's team studies the mechanical properties of the tiny parts with minuscule stamps and needles. After all, the properties of materials change if we build tiny parts: Ductile metals become harder; brittle ceramics, on the other hand, become ductile with very small component sizes. "The prerequisite for any examination, however, is that we are able to produce the objects we are interested in based on defined criteria," explains the Empa researcher. Thus, Michler's team not only strives to master one single process step, but also keep a grip on the quality of the entire process chain. "Some process steps are closely intertwined," says Michler. "If we change one parameter, such as the geometry of the electroplating molds or the composition of the alloy, we usually have to adjust the preceding and subsequent steps, too. We want to understand these connections and the effects of miniaturization in every aspect." 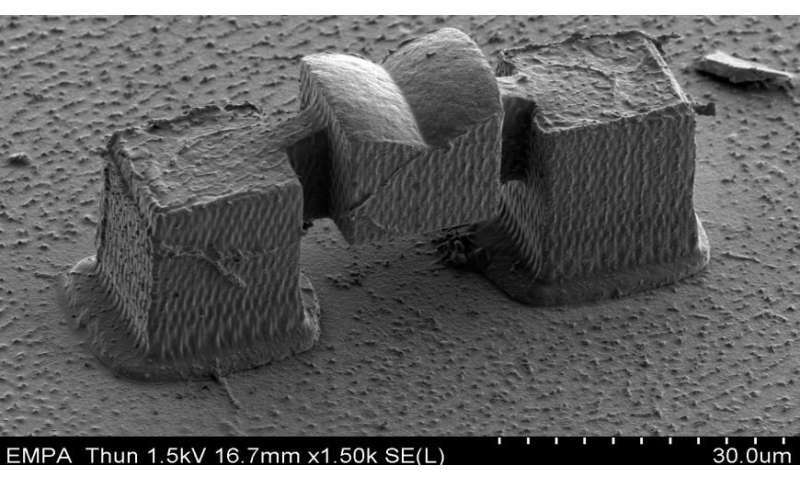 Besides two-dimensional structures, the researchers in Thun have already made progress in the production of 3-D structures – also with the aid of electroplating. 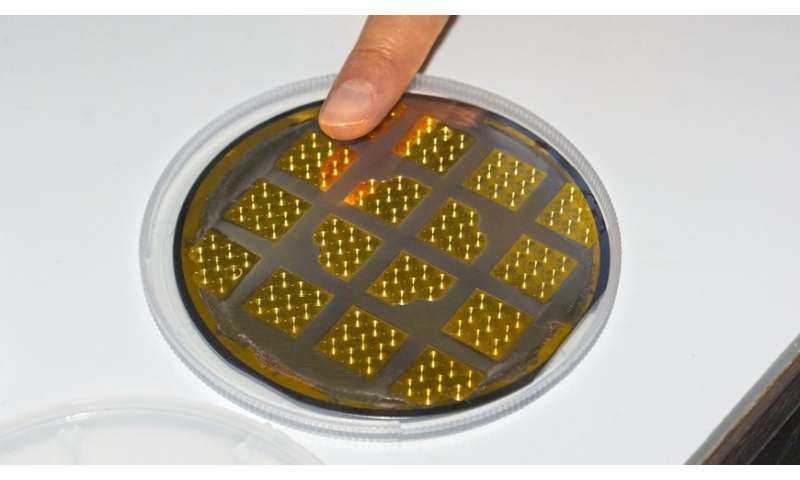 The required molds are not produced by illuminating layers of paint on silicon wafers, but rather via what is known as two-photon polymerization. This involves emitting a laser beam in a container with a special liquid plastic precursor. In the focal point of the beam, the liquid polymerizes and solidifies. The Empa team succeeded in making delicate structures and electroplating them with a nickel boron coating. In strength tests, these metallized structures exhibited much more stability than the raw polymer scaffold. Meanwhile, the researchers have also managed to produce bridges and columns made of solid nickel that are merely a few micrometers in size. Stress tests reveal how the nickel alloys behave in these dimensions. "We are already able to make such structures with a nice regularity and in a replicable manner," says Laetitia Philippe. "We have taken a major step forward on the road towards micromechanics made of electroplated components." In the not too distant future, these components might permit clock mechanisms with particularly fine mechanical complications. Silicon brittle? Not this kind!